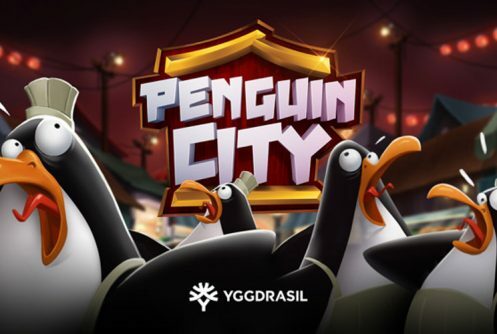 Penguin City from Yggdrasil is a Win All Ways, 5 reel middle variance video slot with sharp graphics further punctuated by sticky wilds that’s added to the reels. With regard to the game’s in-play bonus modes it’s fitted with a Penguin Escape and Emperor Penguin features. The top jackpot that can be won on a single spin is 1,647x your stake. It’s one of those slots that grows on you every time you play it, after all penguins are cute little critters! Symbols that appear on the reels are diamonds, spades, hearts, clubs, diamonds, soup bowls, fish broth, soy sauce bottles, noodle boxes, cleavers and the Emperor penguin (staked wild). The most lucrative symbol is the box with noodles in it, 5 of them pays 250 coins that’s if you play the maximum bet per spin. The RTP (average return percentage) of Penguin City is 96.2% which is quite good given that it’s of medium volatility. 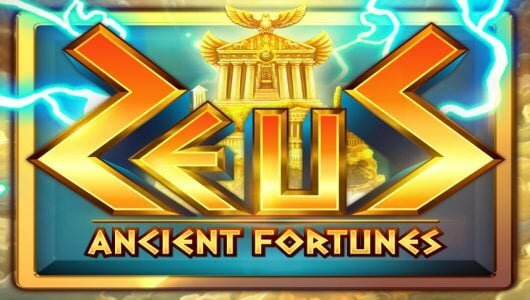 The game is playable on mobile casinos (Android, iOS, tablets) and PC desktops (Apple Mac, Windows) from £0.10 up to £125 per spin at our best Yggdrasil casinos. 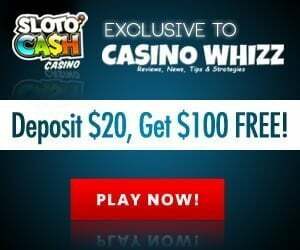 An Auto Play feature spins the reels for you for a set number of times and there’s a Max Bet button for the high rollers. Against the backdrop of the reels you’ll see the penguins traipsing up and down entertaining you with their hilarious antics. During regular play the wilds are saved on the reels until they form part of a winning combination by substituting symbols adjacent to it. The wild is also responsible for triggering the Penguin Escape bonus round. Once the feature is active a few ‘minor’ penguins enslaved by the ‘wicket’ Emperor penguin will try and escape. 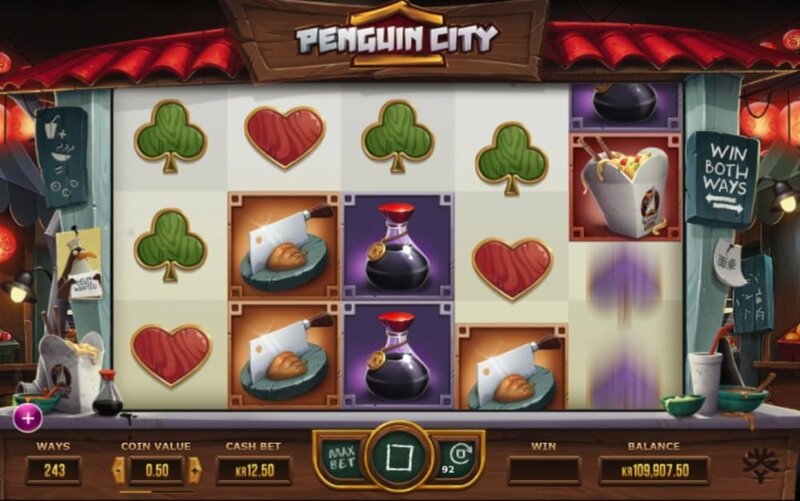 For every penguin that appears on the reels a sticky wild is added to reels 2 or 4, in hindsight re-spins are given providing no winning combinations are formed. 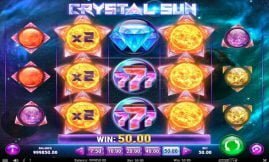 The feature is played when the stacked Emperor wild pitches on the centre reel, basically you’re guaranteed a payout, however, the walking wild moves down one row on each spin until it drops off from the reels. 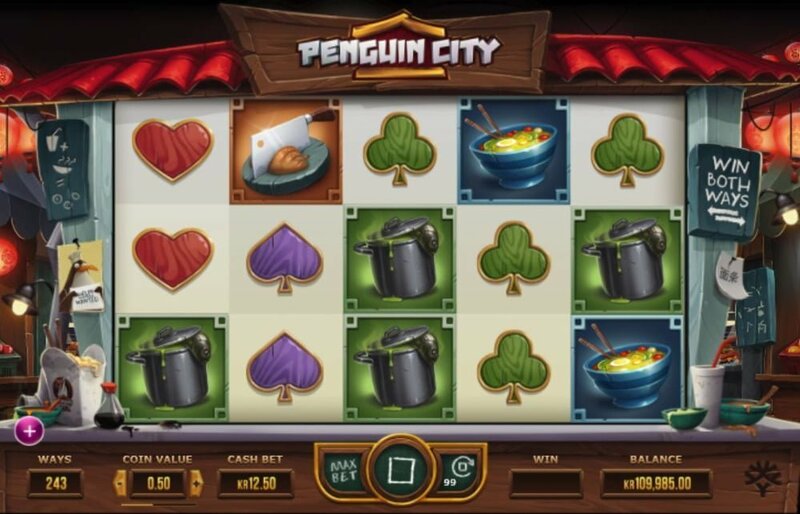 Don’t expect a win on every spin because Penguin City is rather stingy. The focal point of the slots are the Emperor stacked wilds and the wilds, the former enjoys centre stage during the Emperor Escape feature. 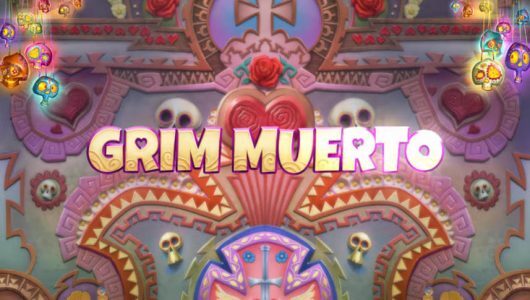 The game mechanic is built around an engaging theme that has proven to be a huge hit with players. 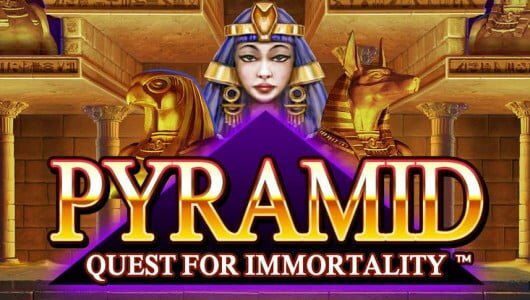 Regrettably it doesn’t have a free spins feature but in combination with the walking Emperor Wilds and re-spins offered during the Emperor Penguin it more than makes up for this.